1. If I begin my rope at the miter line in a corner, how do I ensure that the design will arrive at “just the right place” (meaning the neighboring miter line)when I reach the opposite corner? 2. Even if I get right to the miter line in the 2nd corner, how in the world do I turn that corner? The template in the photo is the one I’m using for this experiment. If you look closely, you’ll see a dotted line etched into the template. This dotted line is important, as you’ll be placing it directly over your midway line that moves all the way across your border. Now, before I go any further, I need to point something out. It is a complete coincidence that the final rope cable terminates at the center point. This was not planned and you should be prepared to have to deal with a way to connect the 2 center rope cables that don’t actually meet at the center. You will just have to wait for another day when I encounter this for an example of how I will deal with this down the road! For now, know that the first side is done and now we move to the opposite corner and begin just as we did before. The only difference is that the cables are oriented in the opposite direction, so I had to flip the template over and use it in the opposite way. Totally fun! Can’t wait to try this on a real quilt! Thank you, quiltshopgal! 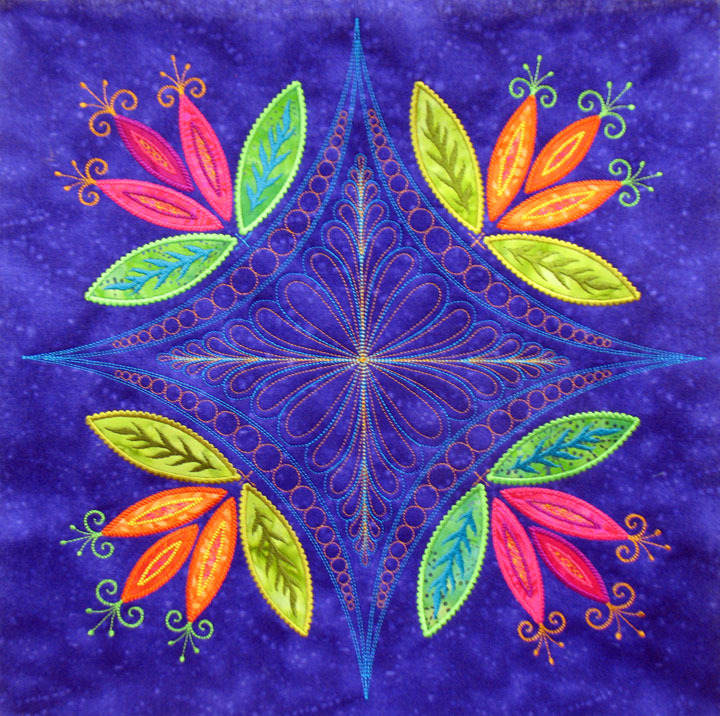 This background fabric is a hand-dyed cotton sateen and it is yummy to quilt. Can’t wait to start on the next section! When you have an important motif (and that motif could be a quilted, appliqued, or pieced motif), you can frame it with your quilting design. 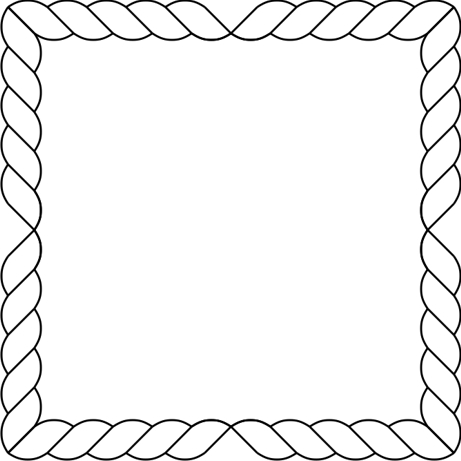 The trapuntoed feathered wreath in the center block is important, and it’s been highlighted further through framing. Unfortunately, the overall size of my block didn’t leave me much room for framing, but there was enough room for a small frame design. 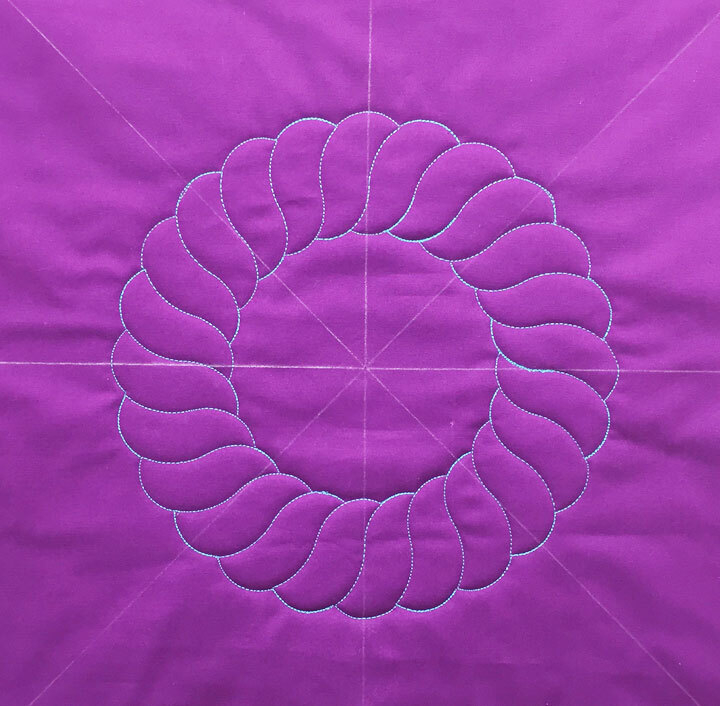 Learning to create custom featherettes to fill spaces on a quilt is a very, very useful skill to develop. If you are interested in learning more, this is an old blog post that talks about them a bit and you can find it by clicking here. An even more in-depth instruction can be found in my Craftsy class called Ultimate Free Motion Feathers and you can find it by clicking here. In this next shot, the channel work is complete and I’ve drawn a temporary circle surrounding the whole enchilada. This soap circle marks the boundary line for all my plumes when I go to complete the feathered wreath. The last few weeks have kind of whizzed by and the only quilting I’ve done have been demos in classes. 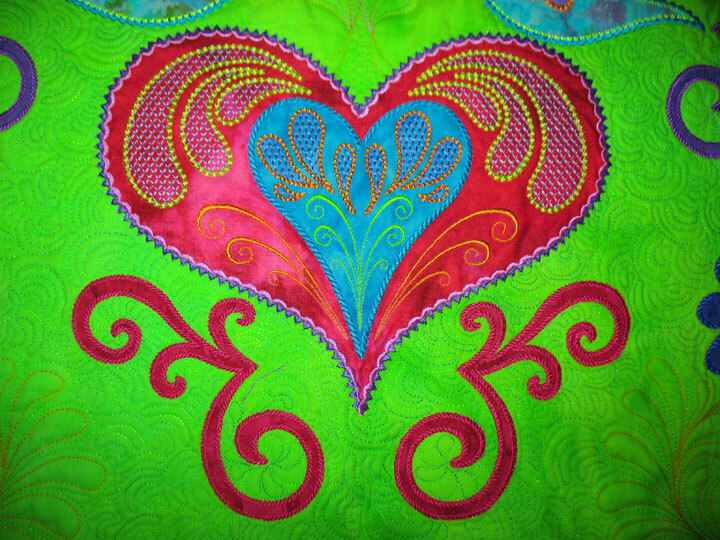 I’m throwing in a few quilt photos here to thank you for coming to my blog even though I have no new work to blog about! 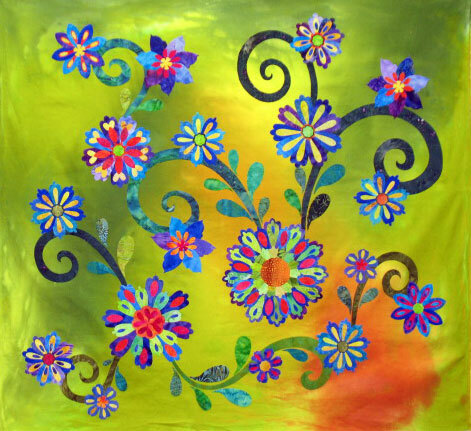 (Doesn’t this table runner put you into a springtime mood?) Anyway, I was straightening out some drawers last Friday and came upon a bunch of paperwork from an event that had occurred literally 8 years ago to the day…how’s that for a coincidence?! Anyway, the event was that I was a stem cell donor for a young man with a lymphoma. The whole experience was very moving and ended up being pretty easy. One of the things I remember about it was that Mother’s Day was just after the donation, and I felt so happy all day because I kept thinking that this guy’s mom was probably feeling great, that her son had another chance. My guy did very well but then suddenly died 6 months later, just before Thanksgiving. Ever since then, I still think about that mom every Mother’s Day and wish I could reach out to her some way. It’s funny how you can feel so connected to people you really don’t know at all. If you’ve ever thought about being a stem cell donor, do it! If you are curious about how the process works, I wrote a blog post about it in May of 2009 and you can read that by clicking here. Hopefully, I will have a new post later this week with photos from some current quilting!